July 10, 2017, 11 a.m.
Just checking in again: There’s still a big partisan divide in the U.S. over what kind of impact the media has on the country. 85 percent of those who identify as Republicans (as well as the Republican-leaning) think the news media has a “negative effect on the way things are going in the country,” according to a Pew Research study released Monday that looked at perceptions of several national institutions, including the news media, colleges and universities, churches, labor unions, and financial institutions. That’s about the same percentage of Republicans last year who thought the news media had a negative impact on the country’s direction, though that’s up from 68 percent in 2010. Democrats themselves are divided on their view of the news media’s impact on the country. But 44 percent see it as having a positive impact on the country, up from just 33 percent a year ago (46 percent say the news media negatively impacts the country). 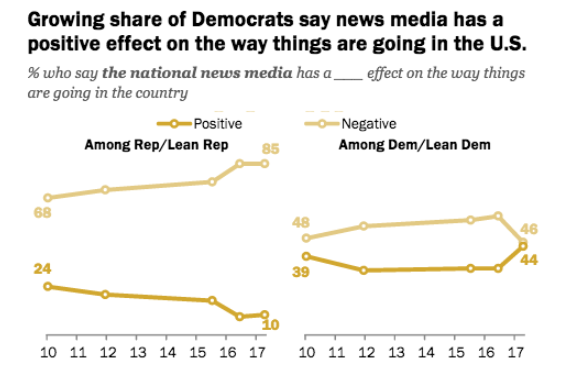 Breaking that down further, 53 percent of Democrats with a college degree believe the news media has a “positive effect” on the country’s direction (a jump from last year when that was 31 percent; as well as two years ago, when it was 30 percent). Among Democrats without a college degree, the change is smaller: 40 percent think the news media has a “positive effect,” up from 34 percent in 2015. 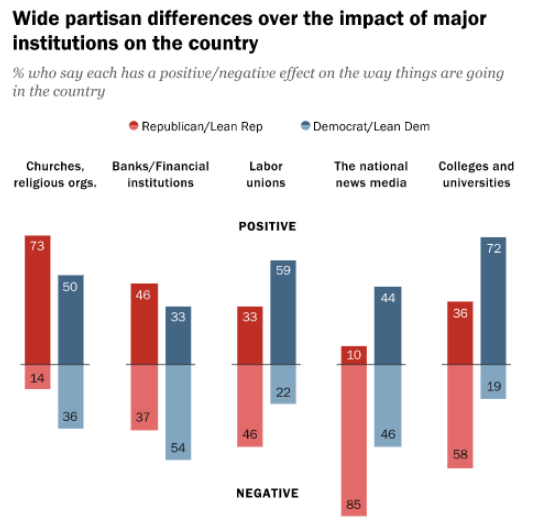 58 percent of Republicans and Republican-leaning independents say colleges and universities negatively impact the country (last year, that number was 45 percent). 72 percent of Democrats and the Democratic-leaning say colleges and universities have a positive effect, a number that has mostly held steady in the past several years. Wang, Shan. "Surprise! Democrats and Republicans are divided on the impact of the news media." Nieman Journalism Lab. Nieman Foundation for Journalism at Harvard, 10 Jul. 2017. Web. 18 Apr. 2019. Wang, Shan. "Surprise! Democrats and Republicans are divided on the impact of the news media." Nieman Journalism Lab. Last modified July 10, 2017. Accessed April 18, 2019. https://www.niemanlab.org/2017/07/surprise-democrats-and-republicans-are-divided-on-the-impact-of-the-news-media/.